It seems like Arnold Schwarzenegger just left his political career, yet he’s already had a few movies hit theaters (THE LAST STAND and ESCAPE PLAN) and many more on the way. 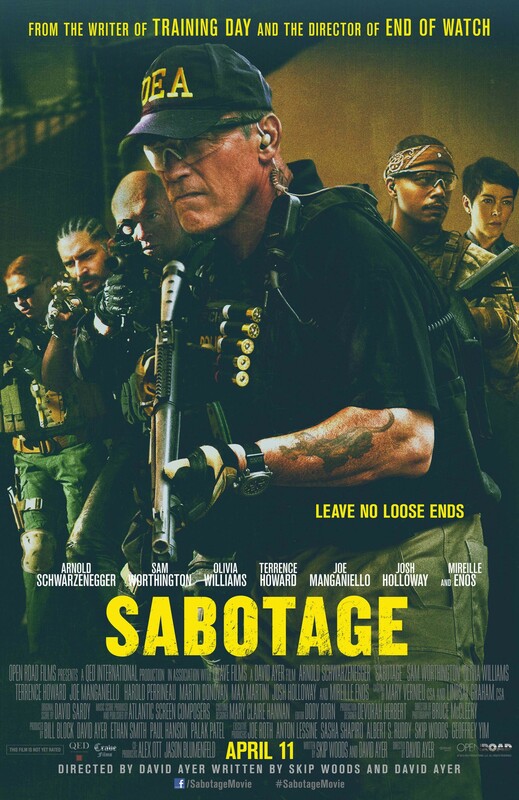 Next up is SABOTAGE, which co-stars Sam Worthington (who is barely recognizable here), Terrence Howard, Joe Manganiello (True Blood), Mireille Enos, and Olivia Williams. It’s written by Skip Woods and David Ayer and directed by Ayer (END OF WATCH). Check out the first poster (above) and newest trailer below. While I’m not entirely sure I want to see an ultra-serious Arnold film again (everyone remember END OF DAYS? ), the involvement of David Ayer has me hopeful, and the cast is pretty solid here. Arnie has MAGGIE next (a zombie movie with Abigail Breslin) and eventually planned sequels to CONAN and THE TERMINATOR… in other words, he’ll definitely be back after this. Tell us what you think of SABOTAGE in the comments below.